Ohio Local 1280 members donated and assembled bikes for the Salvation Army’s “Bikes for Kids” drive. From toy drives to bike collections, the IAM is banding together this holiday season to help spread some cheer to working families across the country. 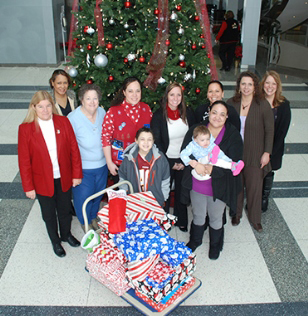 IAM Headquarters staff donated presents and Christmas dinners to two Washington, DC-area families this holiday season. Boeing employees in North Charleston, SC, who are in the midst of an organizing drive with the IAM, joined forces with local members of the Longshoremen’s Union to collect gifts for the Toys for Tots program. IAM Headquarters collected donations from employees so that two Washington, DC-area families will have presents, stocking stuffers and a Christmas dinner this holiday season. The gifts were wrapped and delivered to the families. 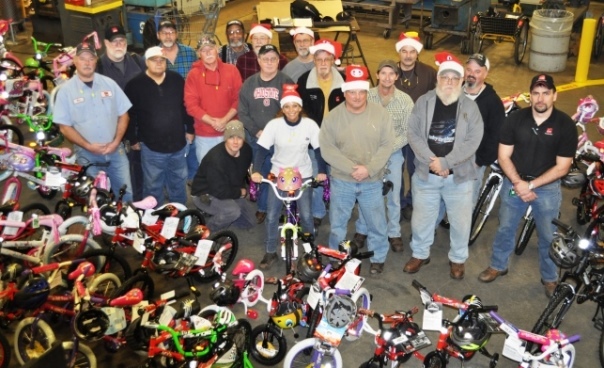 IAM Local 1280 in Newark, OH, along with the Electrical Workers (IBEW) and the Glass, Molders, Pottery, Plastics and Allied Workers (GMP), bought and assembled 86 bikes and helmets for the Salvation Army’s “Bikes for Kids” drive. The 10-year tradition is carried on in the memory of deceased IAM member Dave “Stinky” Pugh, who along with his wife would donate several bicycles each holiday season to the program. The members, employed at fiberglass-manufacturer Owens Corning, raised money for the bikes through employee donations, contributions from other unions, local businesses and other organizations. Management also joined in by raffling off a vacation day, bringing the grand total raised for the effort to $6,100. Over the years, the Newark team has donated more than 790 bikes to the program. 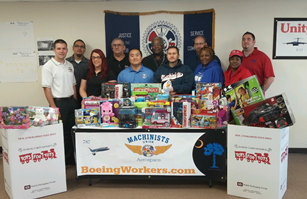 Boeing employees in North Charleston, SC, who are working to organize with the IAM, teamed with local members of the Longshoremen’s Union to collect Christmas gifts for the Toys for Tots program. The donations were given to children in the Charleston area.